As you may have guessed, I am a really big fan of cake. I used to run a cupcake company for several years, and developed quite a ridiculous obsession with sprinkles and cupcake cases. So it was quite exciting when Just Bake got in touch - I am a sucker for a baking supply shop! 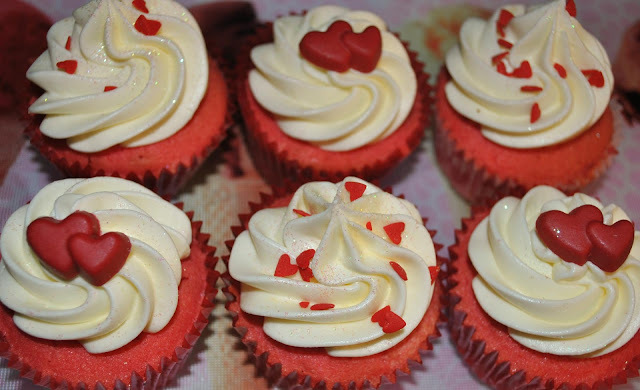 It also provided an ace excuse to bake some cupcakes that would be perfect as a Valentine's Day gift. Home-made presents are brilliant because they are really thoughtful, cheap and tasty! I made vanilla cupcakes (using this very easy recipe) and coloured the sponge pink (using this trick). This is a really simple cupcake to make, but it looks really striking - especially if you pipe on bright white piping, which really shows off the bright sponge. I then decorated the cupcakes with mega cute double hearts gifted from Just Bake, and smaller sprinkle hearts that I already owned. I added a tiny bit of edible glitter, and here you have it - perfect wee Valentine's cakes. 1. Liv cupcake cases - ridiculously lovely. Imagine raspberry cupcakes with white frosting in these! 2. Reuseable cupcake cases - this is the first time I've seen cupcake cases that you can reuse! Lovely and retro looking. 3. Gold dragees - everyone needs gold dragees (unless, random fact, you live in California where they are illegal). 4. 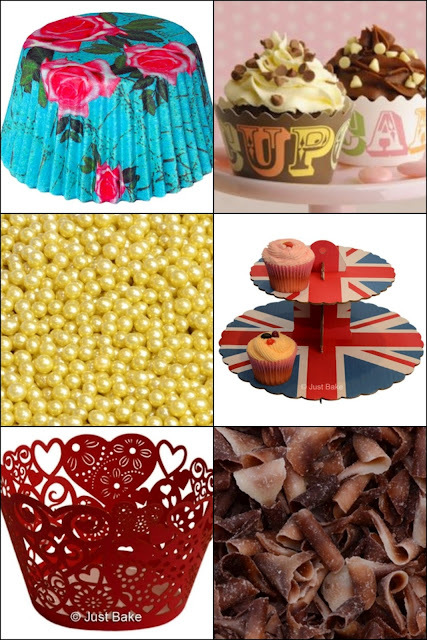 Union Jack cupcake stand - I would like to use this at a tea party with flags please. 5. 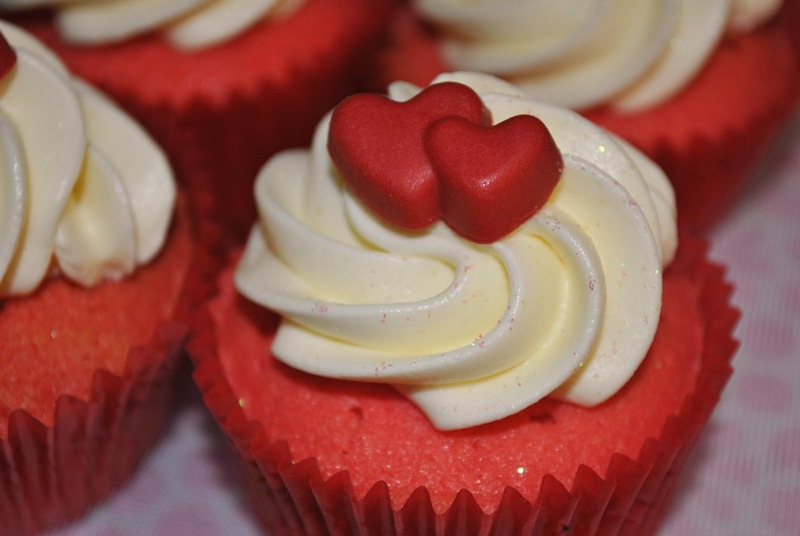 Red heart cupcake wrappers- almost too pretty to put food in. Perfect for a special occasion! 6. Marbled chocolate curls - yes! Chocolate curls are such an easy way to decorate. Put them on top of a chocolate mousse cake and you'll have the most decadent cake ever (a good thing). Phew! If that has inspired you to bake then I have good news - Just Bake are offering a 10% discount if you spend £20 or more. 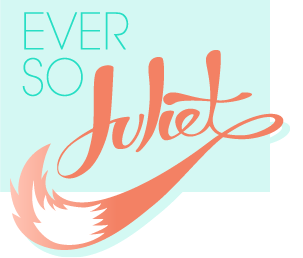 Just use the voucher code 'JULIET' when paying (this expires on 10th March 2012). Those cupcakes look gorgeous - think I might have to have a go at them this weekend! Too cute! I love cupcakes :) my bf is the baker, not me, and he always makes amazing cakes for V-Day! We won't be together this Valentine's though so I'm missing out, although he does bake regularly, but there's something nice about him baking for me on Valentine's! Lovely post, I actually feel inspired to break out the baking wares lol! I love these!! They're so perfect for Valentine's Day! The big hearts are perfect. I hope you're having a lovely weekend! Your cupcakes do look amazing!! Yummy!! ~ Stop on by sometime! I'm one of your new followers! :-) Happy Sunday! These look awesome! I'm a complete cupcake novice so what shape nozzel do you use to get the frosting like that? Yum! I'm a huge fan of cupcakes, and the ones you made look deelish! Whenever I try making them they never look as cute as yours do! I'm not much of a baker, although I love baking. This is really a lovely cup cake gift for our loving one. I’m baker from now for my valentine.